The Herman Miller Aeron Classic Task Chair is a one of a kind chair and setup to be the premiere executive chair. When you walk into an office or are introducing yourself to a business partner, it’s always nice to have a chair that stands out among the crowd and introduces itself as the boss of all chairs. The Herman Miller Aeron Chair has a lot of different features and comes with a lot of different customization options. The Aeron had set the bar for customizable ergonomic office chairs for an entire decade. This was one of the first ergonomic office chairs that didn’t burn a hole in your wallet and was widely available enough to quickly become popular amongst business moguls and celebrities alike. The Aeron appears simple at a distance but is far from it close up. Oddly enough, it’s the Aeron’s simple yet unique comfort template that gives it its famed popularity. This chair eliminates fatigue for hours and somehow manages to keep you as fresh and springy as when you pop down into it. So many small details have been thought of. There are three tilt levels to go from upright, to mid recline, to full recline quickly. There is even a tension control knob to decide how much effort it should take to lean back. This helps to prevent that feeling like you will tip over by reclining too quickly. We wouldn’t really say that this is one of those chairs where you could lounge about in or recline it down all the way and take a quick nap. This chair is designed to help with an active posture and keep you feeling productive during stressful work hours. The Aeron’s actually also found itself quite a strong following amongst gamers. Many prefer its sober styling and superior comfort profiles and customization as compared to those of most gaming chairs. Unfortunately, it does tend to cost a fair bit more than most gaming chairs do. The older models can be found for much cheaper prices, but it’s almost like a treasure hunt these days. This wasn’t an easy chair to get our hands on to test out because they’re constantly going out of stock. They’re always running out, so if you take even a slight interest to the chair and can put aside the price tag, you might want to hurry and get yourself one after reading this review, because you don’t know if they’ll be out again. At the time of our order, they only had 2 in stock, so we got kind of lucky to get to review this one. I’ve actually spent a bit of time in an Aeron before and I’d been impressed. I wasn’t as knowledgeable about gaming chairs back then, so most of the subtleties and finer points went right over my head. This time around, I’d not only been able to feel that familiar comfort that I’d been so impressed by, but also a plethora of rather unique little features that I haven’t quite felt on any other chairs so far. The most noticeable of these features is the design of the lumbar support system and the way it interacts with the mesh upholstery to give you a cleverly tensioned support system. The design seems like something out of The Matrix or some kind of unique modern office. This Herman Miller Aeron chair has breathable material with heat soaking technology built into the chair, so you won’t have to worry about sweating profusely while you sit and do your thing for long periods of time. This chair also helps prevents the flood and formation of blood clots with the dipped soft front base that’s easy on your thighs, unlike most office chairs. The frame and overall durability of the Herman Miller Aeron chair is rock solid. The base of this chair when you’re putting it together (yes, there is some assembly required), you’ll notice is a bit different than most office chairs. One of the main things is how sturdy and heavier the under carriage base of the chair is. It snaps into place with the tubular metallic frame and isn’t going anywhere after that. While the majority of these chairs come in a medium size, they can support a good bit of weight on them without folding under pressure or wearing down. Everything about this Herman Miller office chairs was designed to be more modern than most office chairs. When you see the design of a typical office chair, you probably imagine those plain black over-padded dollar store chairs that tend to wear down after a month of use. This chair however has abandoned the traditional use of extra and stuffed padding. This chair in its overall design uses a breathable material called Pellicle suspension. There’s several reasons for this and one is being while it still provides ultimate comfort, it allows body heat to flow outside of the chair rather than build up on your body. The front edge of the base of the chair also has this waterfall design which allows your legs to seamlessly flow off of the chair and not form blood clots, which are a danger to anyone who spends a lot of time sitting down. We’re always nervous about testing non-padded chairs because the padding is usually what makes the most comfortable seating position. However, with the Herman Miller Aeron chair, we were pleasantly surprised and it was a nice seating position. The various holes in the material used for the backrest were nice to lay back on and the material used in the chair is very supportive. It never puts a strain on your back and you can sit in the chair for hours without any complaints what so ever. If you like to work while sitting up straight, and you should as this is best for maintaining a good posture, then the design of the chair from seat to head will keep your spine aligned. Your lower back will get good lumbar support keeping proper blood circulation. This increased blood flow will keep you focused and productive for prolonged work or gaming. Armrests can be adjusted up and down to get the right level based on your height as well as pivot in and out in case you need more room in the seat. Infinite adjustability makes this customizable for every body type. Pivot Technology – One of the most impressive features of the Herman Miller Aeron Task Chair is the pivoting technology that adapts to every single part of your body to help you relax and stay comfortable. It’s not every day that you see a chair that can not only tilt back to whatever position you feel comfortable in, but adhere to your neck, hips, knees, shoulders, ankles and other parts of your body. You can lean back in any position you want without putting a strain on any part of your body. 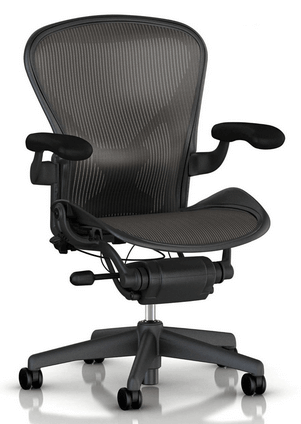 Breathing Material – The material used in this Herman Miller Aeron office chair is called the Pellicle suspension technology and this greatly helps to make sure that heat doesn’t build up on your person. This is great for numerous reasons but anyone who has sat in a cheap office chair knows that after a while, you’re going to start sweating or feel a little uncomfortable. This chair works to remove that annoyance with its breathable material. Front Edge – An impressive feature is the waterfall front edge of the seating. This helps to improve blood flow and will help even reduce blood clots in the legs. This is a danger to anyone who sits in the seated position for a long period of time. Not only does it help reduce blood clots, it keeps you comfortable and it’s been proven that improved blood circulation help keeps you focused and alert, allowing you to do your job better. Superior Warranty – When it comes to an amazing warranty, no one offers a better deal than the Herman Miller office chairs lineup. When you receive your chair, you’ll get an official born on date sticker and a nice 12 year Herman Miller warranty. Most people never have to use or claim that warranty because the overall quality of the chair will greatly outlast 12 years. Q: If I order this chair, will it come fully assembled? ​A: No, it won’t. There’s no way to send a Herman Miller Aeron Task Chair like this fully assembled and while there’s some assembled required, it’s painless and easy if you follow the short step by step instructions. Q: What kind of material should I get? (classic, wave or pellicle)? ​A: This is a personal matter but every single material is comfortable. There’s no overall better than others option out there for people looking for a definitive material. They’re all comfortable and breathable materials. Q: I’m taller than 6 feet and a little heavier, will I fit comfortably in this chair? ​A: Yes, you’ll fit just fine. The chair was built for anyone from the smaller sized to medium all the way up to large sized customers. There’s people who are 6’5 and above who report being comfortable in this chair without issues. While we understand the Herman Miller office chairs might not be everyone’s first choice due to the exhausting price tag that the company has put on the chair, it might be worth it to go over other chairs in the market with the same price tag or close. 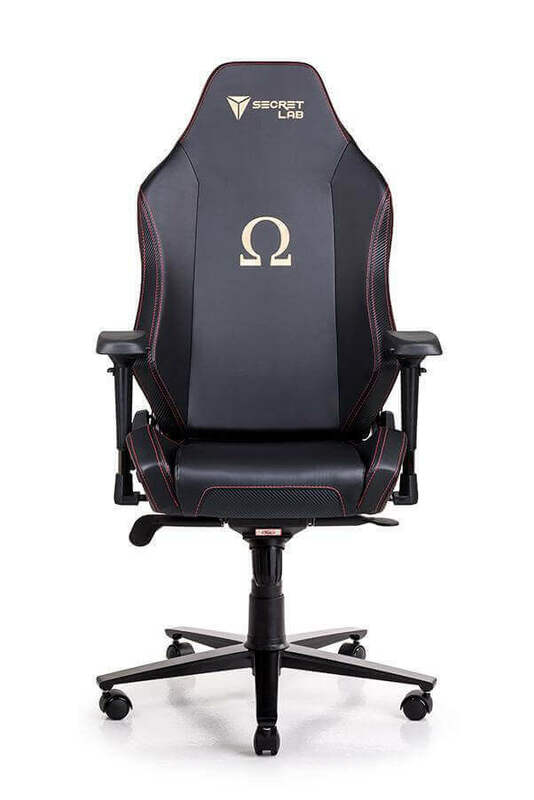 First, we have the CXO Executive Mid Back Chair in Black w Headrest. While this chair is comfortable, it doesn’t offer the amount of flexibility or breathing room that the Herman Miller Classic Aeron Task Chair offers. It’s also not as customizable and the reviews aren’t as favorable for this chair. Next, we have a nearly low $xxxx chair by a company called Steelcase. The Steelcase Leap Chair, Black Fabric is a relatively high quality chair but it’s not as comfortable to sit in and doesn’t offer the ease of flexibility that our reviewed chair does. It however is economically friendly as it’s made by recyclable materials. Finally, we have the Zody Chair by Haworth. It does offer a lot of customization and is easily adjustable but the problem with this chair compared to our reviewed chair again is the level of comfort. This chair was made for the pricing point rather than the overall comfort and design. It’s a high performance chair and solid quality but lacks in overall material used compared to our reviewed chair. If good design means something to you, then you will definitely love having this Herman Miller office chairs in your office or gaming room. It is a pleasure to look at and shows off your sense of style. Function should always come before form when talking about an office chair, and in that the Aeron exceeds expectations. Appreciate the better things in life while also taking care of your back health.